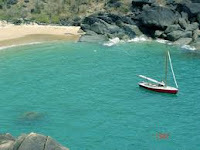 The Butterfly beach is a beautiful beach situated towards the north of the Palolem beach. Here one can see a tiny stretch of perfect white sand and translucent waters. It is very suitable for those seeking peace and isolation and is one of the quietest and unexplored beaches in Goa. The Butterfly beach is surrounded by a lot of rocks. It was given the name 'Butterfly beach' by the tourists as in the earlier days it is known that when the trees on the hillside near the beach bloomed, one could see a lot of butterflies here. During low tide, one can also reach the beach by walking which is enticing as one can enjoy the hiking trails and sunsets on the way. The Butterfly beach can also be reached by walking for a couple of hours through a forest.